Random House Trade, 9780812967340, 352pp. In this brilliant, luminous novel, one of our finest realist writers gives us a story of surpassing depth and emotional power. Acclaimed for her lucid and compassionate exploration of the American family, Roxana Robinson sets her new work on familiar terrain--New York City and the Adirondacks--but with Sweetwater she transcends the particulars of the domestic sphere with a broader, more encompassing vision. In this poignant account of a young widow and her second marriage, Robinson expands her scope to include the larger natural world as well as the smaller, more intimate one of the home. Isabel Green's marriage to Paul Simmons, after the death of her first husband, marks her reconnection to life--a venture she's determined will succeed. But this proves to be harder than she'd anticipated, and the challenges of starting afresh seem more complicated in adulthood. Staying at the Simmons lodge for their annual summer visit, Isabel finds herself entering into a set of familial complexities. She struggles to understand her new husband, his elderly, difficult parents and his brother, whose relationship with Paul seems oddly fraught. Furthermore, her second marriage begins to cast into sharp relief the troubling echoes of her first. Isabel's professional life plays a part as well: a passionate environmental advocate, she is aware of the tensions within the mountain landscape itself during a summer of spectacular beauty and ominous drought. In her cool, elegant prose, Robinson gracefully delivers a plot that is complex, surprising and ultimately wrenching in its impact. As the strands of family are woven tightly and inevitably together, and as the past painfully informs the present, the vivid backdrop of the physical world provides its own eloquent dynamic. 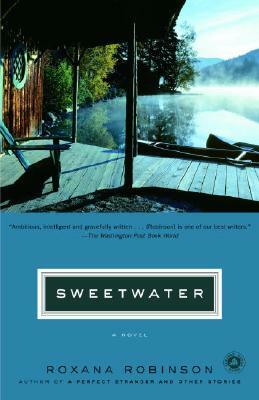 Sweetwater is a stunning achievement by a writer at the peak of her craft. Roxana Robinson is the author of two previous novels, a biography of Georgia O'Keeffe and two short-story collections. She has received fellowships from the Guggenheim Foundation, the National Endowment for the Arts and the MacDowell Colony. Robinson's fiction has appeared in Best American Short Stories, The Atlantic, The New Yorker, Harper's and Vogue. She lives in New York City and Westchester County, New York. From the Hardcover edition.